Love Combe Down: A talk by local residents Sally and John about the comprehensive eco-renovation of their home. 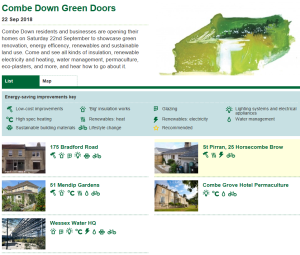 Linking with our Green Doors event later in the month, they will describe the principles as well as their real life experience of making a house energy efficient and sustainable to run. Further information here. The Museum of Bath Stone, Combe Down Monday 10th September. Doors open at 7pm for 7.15pm start.